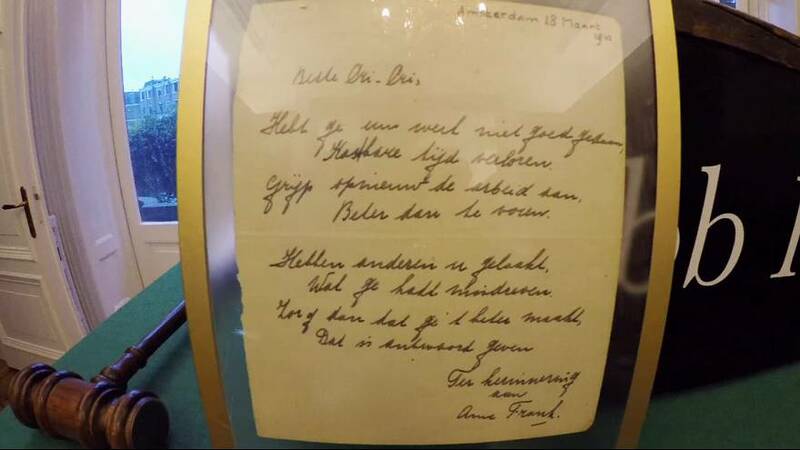 A poem handwritten by Jewish schoolgirl Anne Frank has sold for a high price at auction. It’s only eight lines long but it sold for 140,000 euros in the Dutch city of Haarlem. Anne Frank wrote a famous diary chronicling her life hiding with her family from the Nazis in a secret annex of an apartment in Amsterdam. It went on to sell millions of copies worldwide. The first four lines of her poem were copied from a magazine and encourage her older sister to work hard at school – but the last four lines are likely to have been her own work. It was written just four months before her family was forced into hiding after the Germans invaded The Netherlands. They were eventually betrayed to the Germans and Anne Frank died at just 15 in the Nazi death camp of Bergen-Belsen only a few months before the Second World War ended. The only member of Anne Frank’s family to survive the Holocaust was her father Otto who was convinced by friends after the war to publish his daughter’s diaries.